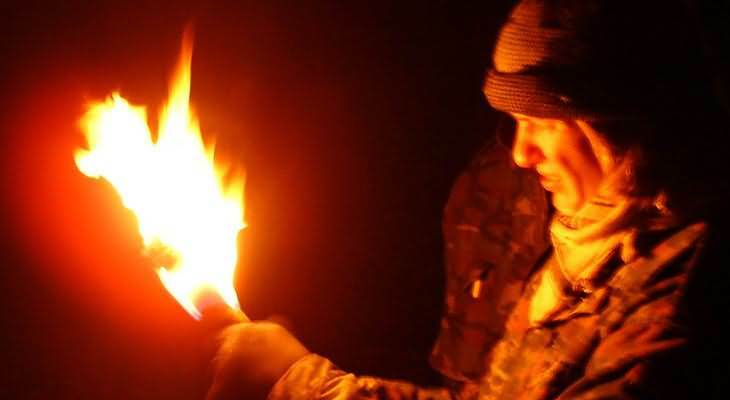 Particularly during the cold season, when the days get shorter and the nights are longer, torchlight hikes or small celebrations around a campfire lighted with torches are popular activities. However, even for the odd terrain game torches are always very handy to mark and illuminate an offensive or defensive target. You can make torches with relatively little effort. However, while making but even more so when burning them, adults should always be close by. Otherwise, in an unguarded moment, the danger is too great that a fire is laid. Torches of wax and jute, for example, can be prepared as follows. For each torch an about 80 cm long, dry stick with a diameter of two to four centimetres, or if you use the paper roll technique, a short piece of wood for the handle. If necessary, roll the newspaper together as a handlebar instead of a stick. If necessary, a ladle to trickle to the wax on the jute. Now on a hearth make a fire, or use a gas cooker instead. Then the wax is melted in an old pot. While that happens, hand guards are made and cut out of cardboard. Then cut the jute strips in about three feet long and ten centimetres wide strips. Once everything is done, you can start to make the actual torches by immersion or the winding method. First, the stick is cleaned and briefly dipped into the liquid wax, whereby at the bottom 15 cm should be left blank. To the wax-covered parts of the stick wrap the jute strips and tie them with a hemp string. Once the stick is covered with jute, it is dipped into the pot with liquid wax, so that the jute can soak properly. After that take the stick out of the wax and let it cool down in the air. This process is repeated until the desired thickness is reached. You also can put a second layer of jute around the torch. Finally, the hand guard is fitted. If you use the wrapping method, the jute strips are carefully dipped into the liquid wax and then wrapped, beginning at the top, around the stick and pressed down. This can be repeated up to three times. The jute strips should additionally be “glued” with wax. Once the torch is completed, the hand guard is fitted. Instead of using a 70-80 cm long stick you also can create a torch handle from a newspaper by rolling it together by a diameter of about 2cm (like a baton from newsprint, such as the famous newspaper hitting game). Fasten the role with some adhesive tape. Then put a short wooden stick into the paper part, which serves as a handle. The newspaper roll itself is then dipped in the wax and wrapped in jute. Proceed like in the methods mentioned above. If necessary, fix it with hemp twine. Designate a danger zone around the hearth.